If you have any questions regarding Primary Recruitment please feel free to call our Recruitment Hotline at 814.863.4693! 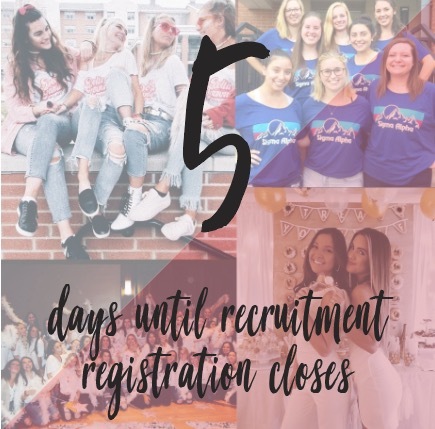 5 days left to register for Primary Recruitment!! Remember, registration closes at exactly 5 PM on December 31st! Check out our Primary Recruitment page to learn more about what being in a sorority means, the recruitment process, and the necessary requirements to participate! Make sure to attend our Meet the Greeks Event if you are thinking of participating in Primary Recruitment in the Spring! This event will take place on Tuesday, November 6th, from 7PM-9PM in Freeman Auditorium! Get the chance to hear from the Panhellenic Executive Board, learn about what it means to be in a sorority, and more! See you there!